In 1966, Britt Ekland appeared in a two-part episode of Peter Falk's short-lived TV series The Trials of O'Brien called "The Greatest Game." The following year, the episodes were edited together, retitled Too Many Thieves and released in movie form. Apparently, it was released theatrically somewhere and it received a lot of television reruns in the decades after. 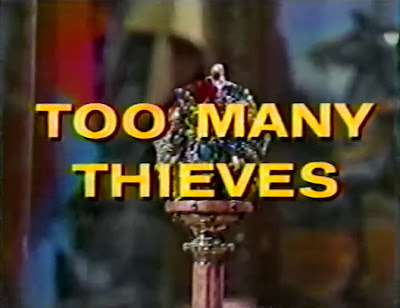 Too Many Thieves is fun and any TV movie fan would not likely be disappointed. 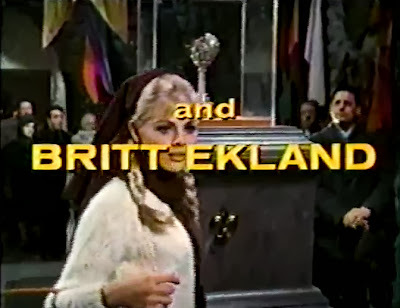 Britt Ekland had not had a lot of exposure in America when this originally aired and I suppose this TV appearance served her well. She is appropriately beautiful here, portraying a Macedonian woman caught up in a jewel heist, and she gets to share scenes with two famous actors, Peter Falk and David Carradine. Unfortunately, Too Many Thieves doesn't have much of a reputation these days. Despite the tremendous popularity of Peter Falk's later series Columbo, The Trials of O'Brien and Too Many Thieves remain vaulted (hopefully this will change! ), despite the large number of guest stars and the likelihood of good sales due to probable fan interest.